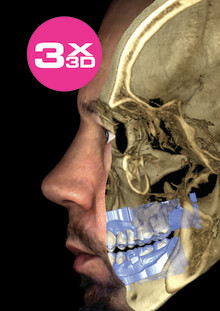 With three different types of three-dimensional imaging – as well as panoramic, extraoral bitewing and cephalometric imaging – Planmeca ProMax® 3D product family meets all modern maxillofacial imaging needs. Here are some of the most frequently asked questions about Planmeca ProMax 3D units. Q: What are the differences between the five Planmeca ProMax 3D units? A: The biggest difference between the units is the 3D sensor size. Each of the Planmeca ProMax 3D family’s units has a different sized sensor, which affects the array of volume sizes that can be taken with that unit. 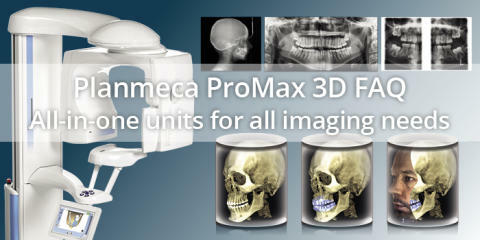 Therefore the Planmeca ProMax 3D Max with the largest sensor size produces all volume sizes for diagnosing the entire maxillofacial region – from the smallest special cases to images of the entire head. Another difference is for example that the Planmeca ProMax 3D Plus, Mid, and Max units are suitable for ear, nose, and throat (ENT) imaging. Q: Planmeca ProMax® 2D can be upgraded into a 3D unit. Are there any other upgrades available? A: The modularity of the Planmeca ProMax unit indeed offers the possibility to upgrade a 2D unit into a 3D unit. There are also other hardware and software updates available. For example, after launching the Planmeca ProFace 3D photo option for the sensors, we have offered the possibility to upgrade old sensors to Planmeca ProFace sensors. We keep constantly developing our software and the updates are available for all Planmeca ProMax users. The upgradability of Planmeca ProMax units makes them a great investment – we want our customers to know that they have invested in a unit that is flexible and upgradeable, making it a powerful and up-to-date tool for many years to come. Q: How often do Planmeca ProMax 3D units require quality assurance or maintenance? A: Unlike some devices at a clinic, the Planmeca ProMax does not require a lot of maintenance. The patient support parts are autoclavable to ensure optimal infection control. Annually, or after every 10 000 exposures, the electrical exposure parameters should be checked to ensure accurate operation of the device. There are different regional legislations and guidelines on X-ray device quality assurance, and we offer tools for ensuring that those guidelines are met (for example image quality phantoms and user-friendly software to help run the quality assurance protocol). Q: Planmeca ProMax 3D imaging units offer the Planmeca Ultra Low Dose (ULD) imaging protocol. How does it work? A: CBCT X-ray is acquired by taking several 2D frames of the patient by rotating the X-ray source and sensor around the anatomy of the patient. Each frame uses a short X-ray pulse with given kV and mA values. When applied, the Planmeca ULD protocol will alter the exposure values by lowering the milliamperes and shortening the X-ray pulse needed for each frame. This will not only lower the patient dose but will also result in a faster rotation time making the scan less prone to patient movement artefacts. Unlike competing low dose CBCT alternatives, the Planmeca ULD protocol does not take fewer frames or use a smaller rotation angle to lower the patient dose. This is why we are able to use the ULD protocol on any resolution or volume size. Also see our Planmeca Ultra Low Dose FAQ. Questions answered by Planmeca X-Ray Product Managers Antti Airisto and Erkki Hiltunen. With Planmeca ProMax 3D units and the Planmeca Ultra Low Dose protocol, patients can benefit from CBCT imaging and three-dimensional diagnostic accuracy with a significantly lower patient dose than in traditional imaging. All our CBCT units support three different types of 3D imaging as well as extraoral bitewing, cephalometric and digital panoramic imaging. This flexibility allows clinics to optimise their imaging and select the techniques that work best with each case. With proprietary ultra low dose and movement correction features also available, Planmeca provides a completely unique dental imaging experience.